Buying a Used Fire Truck? Refurbishment Facility Grand Opening R.S.V.P. 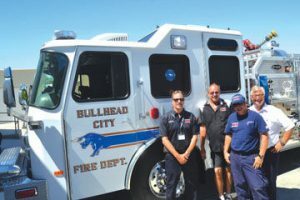 Lake Travis Fire Rescue Featured in The Statesman for fleet refurbishment program! Golden Valley F.D. Spartan Pumper/Tanker Refurbishment Complete! Fire Truck Refurbishment Article Published! Drexel Heights Pierce Saber Refurbishment Complete! Lakeside Fire District’s New KME Pumper is Out For Delivery! Colorado Springs HME Aerial Completed! A fully rebuilt 1989 Oshkosh T-3000 is now on its way to Mojave Spaceport! The Open House was a success! We Hosted a Pyrolance Training Session! American La France Pumper For Sale! 1950 Seagrave Fire Truck Refurbished! FTU delivers two fire trucks to Djibouti, Africa! We Added a Paint, Body and Truck Equipment Service Department! We delivered a KME Rescue to Park City Fire District! Firetrucks Unlimited traveled to Paramaribo, Suriname! We delivered another refurbished Oshkosh T-3000! We delivered a new KME pumper!